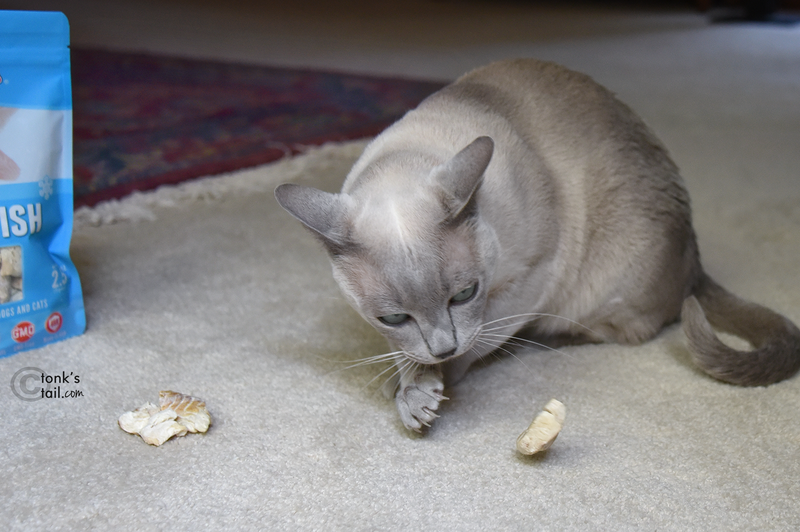 A Tonk's Tail... err, Tale...: Pawesome Treats from Chewy! 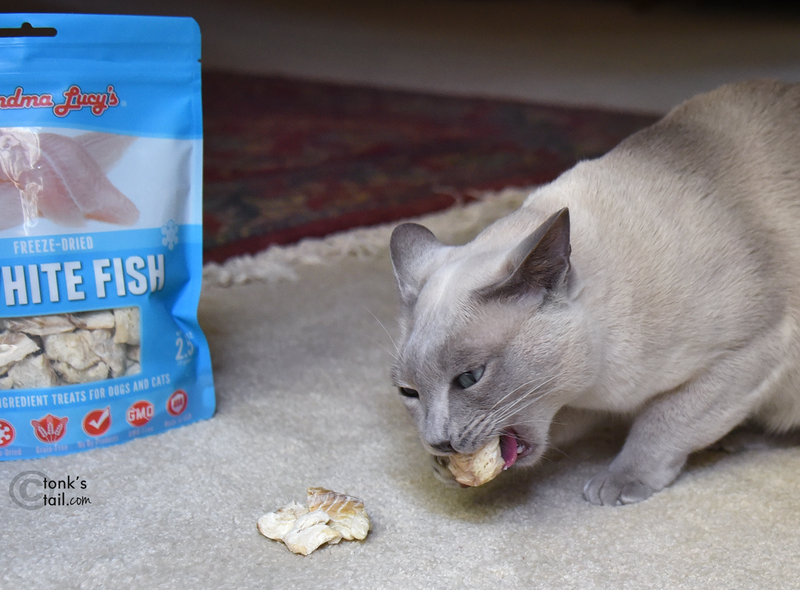 Chewy.com graciously gave us the scratcher and bag of treats to review but we were not compensated for writing this post in any other way. All opinions are our own. Allie: Ahhhh, this Catit bench scratcher (with catnip) is just what the doctor ordered to help me relax after a hard day's work. Faraday: *scoffing snort* Work?!? What work?? Allie: Keeping one eye out for you, Brat, is exhausting. trust me on that. 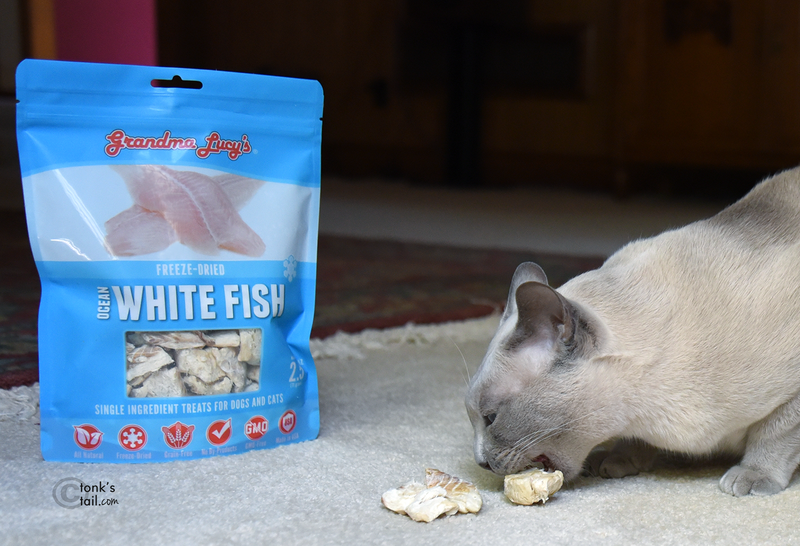 Faraday: Well, while Allie's sleeping I'll just help myself to the nommy freeze dried whitefish from Grandma Lucy. Seriouslies, who knew my Grandma loved me so much? And who knew her name was Lucy? Maxwell: Dood, that's not your Grandma. But whoever has such a pawesome gramma scored big time. Did you see the flakiness in these pieces??? Whooops...get back here. You're mine, not Maxie's! In case you couldn't tell, the August goodies from Chewy.com were a huge hit. Wow, those treats look awesome, and so does that bench! Wow, those look great. 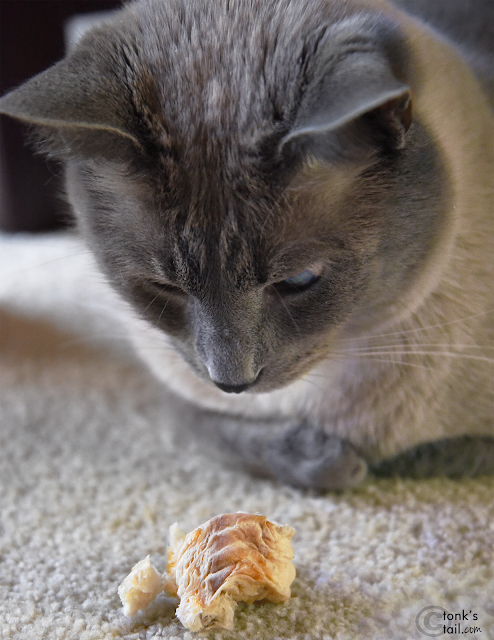 Faraday, that's a really big bite you're taking of that fish... it must taste pawesome! We SO wish we had chosen that bench!!! The Farm cats LOVE the Catit bench. Especially Stinky. Wow those treats look fabulous!!! Glad y'all enjoyed them. We luvved da catit lounge. We didn't twy da gwammaw Lucy's but have had hers chicken afur and luv it. Looks like those brought out the wildness instincts, MOL! Thanks! My cat bro Bert is attacking the monitor trying to get your treats! I'm just saying that my boys would try to sneak these too. They LOVE fish. Hey wait! We thought that was OUR Grandma Lucy! She sure makes tasty treats. We have that bench scratchers - we love it! Those treats look yummy too. 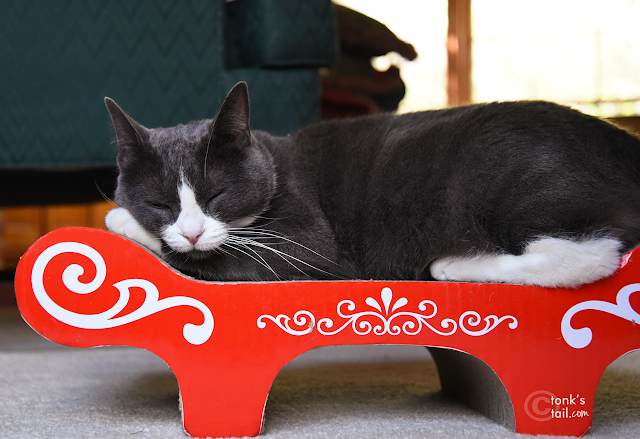 I love my cardboard scratcher/loungers. Those treats look absolutely huge!